You decide whether GNM can achieve some of the more extreme postural corrections in a short time or not. TMD patient presented with severe scoliosis of back and also contributing retrognathic mandible (class II division 2) relationship. 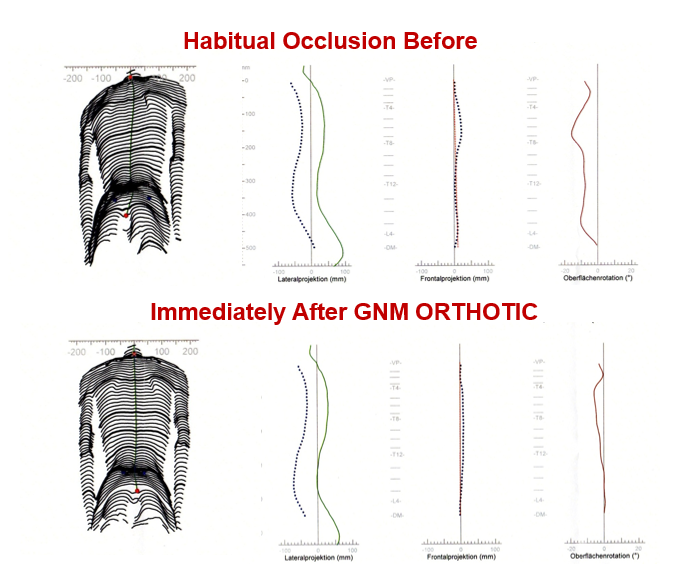 The following postural data shows immediate postural correction before and immediately after using GNM orthotic (same visit). This case was further evaluated and confirmed by an orthopedic expert who confirmed and recorded this data. Courtesy of Dr. Sören Linge one of our astute OC trained dentists who follows our OC GNM protocols.